Your family cat may seem like a tough cookie, but they still need to take care. Especially in the garden. Having them participate safely and happily in family life can be a challenge when outdoor time is involved. 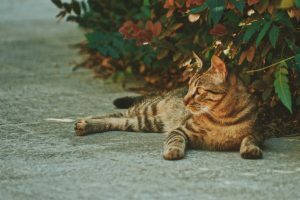 Cats have a specific set of dangers that you might want to consider before allowing free reign in the backyards of Wahroonga, Westleigh, Turramurra and beyond. By a large mile, one of the biggest threats to a happy cat’s safety is human contact. People have some fairly strong views about cats and wildlife for example. We drive cars that are of no match to a wandering cat. And we can mistake a wandering family cat for a lost cat and claim them. This is why it’s important to consider whether letting your cat out at night is a good idea. Cats have absolutely no road sense and can often be hit during twilight, night and dawn due to poor visibility. They can get themselves into trouble with wildlife and get injured, or in trouble with humans that aren’t particularly fond of cats having an altercation with native birds and animals. A cat with an injury in either case can be difficult to find as their first instinct will be to retreat and hide. By the time you find them, permanent damage or even death may be the consequence. Losing a pet to injury, accident, act of violence or through some well-meaning person adopting an already homed cat can all leave the same sense of guilt, loss and grief. Please, make sure your cat doesn’t have the ability to roam at night for their safety as well as the safety of your family and other people. Another great reason for keeping your cat indoors is the presence of bees and wasps in the garden. Healthy habitats need to learn to live side-by-side with bees. Yet they can pose a risk to your family cat. Regardless of the situation, your cat is not going to take well to a bee sting. They are painful, uncomfortable and can cause swelling. Depending on where the bee stings, it could also impact breathing, block the eyes or change movement and rest patterns. None of which is particularly pleasant for your cat. If your cat has been stung by a bee, try to remove the stinger as soon as you possibly can. While this might sound like a particularly difficult task with an unhappy cat, that stinger can continue to push venom into your cat for up to 3 minutes after it has been removed from the bee or wasp. Helping remove that can reduce the impact as a result. A cat will complain about a bee sting and want to try to attend to the area themselves. They may howl, go limp or be lame. If you are concerned about this behaviour, contact our vet clinic immediately for advice. Treatment for a bee sting may vary. If your cat has been stung previously, it might mean giving anti-histamine. Or if your cat is showing signs of allergic reaction, your vet nurse can help you through getting them to our vet hospital straight away. Treat cats being stung by bees and wasps with the seriousness it deserves. Make contact to get advice and assistance if you are unsure. Or bring your cat to a vet immediately if they show signs of allergic reaction. We’ve talked at length about what to do with wildlife in Wahroonga previously. Getting injured wildlife seen to, whether it’s by your pet or through something else, can save their lives. Yet what of your family cat? Cats are predators by nature. They will take on a possum, echidna, lizard or snake without batting an eyelid. The problem is, they could also sustain damage if they do so. That damage can cause problems in the present or in the future. Injuries that are not detected and treated can become infected. You may also find your cat can lose claws, blood and skin health through bites, sharp pecks and scratches sustained in a fight. Crush injuries can be sustained by kittens that tangle with pythons and snake bites from venomous varieties can be poisonous. That’s why it’s important to avoid these situations in the first instance. And if they do happen to arise, take them seriously. Check your family cat for injuries. Look at their eyes, ears, nose and coat. Make sure there are no scratches, bites, puncture marks or injuries. If you do find evidence of damage, don’t risk treating it yourself. Bring them straight to our vet clinic. Always seek veterinary advice and attention as soon as these sorts of signs show in your cat. We talk a lot about fleas and ticks in summer with pets of all kinds. They are of particular issue in your garden. Cats love the shady spots and so do fleas and ticks. Lying around in the garden means having up to date flea and tick prevention for your cat. You should approach flea and tick prevention as a year-round process. This is especially true now we have a mix of warm and cold, wet and humid days across all seasons. Another area of prevention for cats is ensuring the plants you have in your garden are compatible with your cat. Just as dogs have issues with certain plants, so too do cats. Flowers like daisies, dahlias, lilies, and chrysanthemums are toxic to your cat for example. So too are oleander, English ivy, cyclamen, pathos, sago palm, azaleas and rhododendrons. Again, if you see these sorts of signs in your cat, seek help from a vet immediately. One of the best ways to ensure you cat doesn’t end up in difficulty in the garden is to keep your cat indoors. Failing that, please make sure you take steps to keep your cat indoor during night times and remove any and all temptation for trouble from your garden. Owner and Vet Alex Brittan, Vet Katie Syms and the team of Fox Valley Animal Hospital pride themselves on quality service. Fox Valley Animal Hospital is the one you choose for your family pet when the care your animal receives really matters. Fox Valley Animal Hospital is a family owned hospital servicing the upper North Shore of Sydney. Based in Wahroonga, we provide outstanding healthcare for your family pet. Our vet clinic looks after wildlife and all kinds of family pets in Wahroonga, Turramurra, Westleigh, Thornleigh, Beecroft, Waitara, Normanhurst, Cherrybrook, Asquith, Pennant Hills, Hornsby, Warrawee and surrounds. We offer Dog Grooming to the local area, too.